Dull (Andrew Vincent) tries to separate lusty lovers Costard (Fergal McElherron, right) and Jacquentta (Rhiannon Oliver). In Elizabethan England, productions of Shakespeare’s plays were truly popular events, attracting huge audiences and appealing to members of all social classes. Typically staged by day in open-air amphitheaters, these plays were at least as much raucous entertainment as they were scholarly occasions. 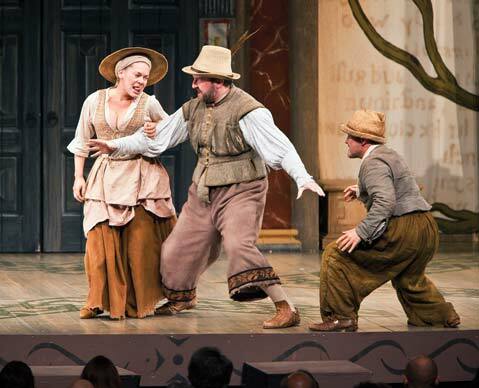 Today, by contrast, Shakespearean theater is situated firmly in the high-art camp, and productions generally attract a highly educated audience. It’s probably impossible to return live theater to the place of cultural primacy it occupied in Shakespeare’s lifetime, but it’s certainly possible to present Shakespeare in the manner in which it would have been presented to a 16th-century audience. That’s exactly the aim of Dominic Dromgoole, artistic director of Shakespeare’s Globe Theatre in London. The company’s production of Love’s Labour’s Lost hints at the mass appeal the play might originally have had; the rowdy stage antics, house lights, and low-tech staging aim to mimic an Elizabethan-era production. What’s obviously missing is the audience’s response: Modern theatergoers are trained to sit quietly with their hands in their laps and hush the errant few who dare unwrap hard candies or whisper commentary to a companion. No matter how it’s staged, Love’s Labour’s Lost is a delight for lovers of language. It’s even more full than the usual Shakespeare play of double entendres, miscommunications, linguistic loopholes, and multiple meanings. Throw in a flamboyant Spanish soldier, four noble scholars poorly disguised as Russians, and a fast-talking clown with an overactive libido, and you’ve got a play that is both wildly entertaining and intellectually demanding. Between the inherent complexities of the script and the minimal amplification used in this production, there were moments when it was easy to sympathize with Costard’s comic admission: “I do confess much of the hearing it, but little of the marking of it.” Yet despite its challenges, the Globe’s Love’s Labour’s Lost captured the zany excitement of an Elizabethan-era Shakespearean comedy, if not with chicken bones being tossed from the pit or audience members breaking into fisticuffs, then at least with a slew of unsubtle sexual innuendoes. As the Princess of France, Michelle Terry was full of sparkling repartee and ruthless wit, while Fergal McElherron’s Costard was unforgettably, gleefully lewd.